The decor at Il Sodo del Sole plays with the traditional Tuscan warmth of terracotta floors, wood beamed ceilings and soft pastel colors and adds a bit of imagination. Claudia and her family have chosen to mix these classical characteristics with universal themes, giving each room its own distinct personality. The comfortable beds in each room assure you of the perfect nights sleep, leaving you refreshed and eager to explore the next day. The rooms all have heating, private modern bathrooms and air conditioning for those hot summer evenings. All of the accommodations at Il Sodo del Sole have access to the quiet little haven of a garden which is filled with natural sunlight and the fragrance of fresh flowers always in bloom. Cool off after a day of hiking, biking and exploring by taking with a dip in the private pool, making use of its garden furniture: the perfect place to enjoy a glass of Tuscan wine before dinner. Roam wherever you want on the premises and you find that you will always have access to Internet. When reserving your room, be sure to let them know how you would like to spend your vacation so that they can assist you in selecting the perfect right environment for you at the B&B. There are 6 different B&B rooms from which to choose, and one is sure to be the perfect match for you, just let Claudia assist you in choosing your ideal spot. There is a room with a kitchenette, or a cosy fireplace, another has a special little courtyard and the shade of an ancient olive tree and several boast a sitting room where you can read, write and catch up on your sleep with a little nap. Next to the main house, there is a selection of self catering apartments, or as they prefer to call them "villini", which are especially nice if you want to experiment cooking with some of the local delicacies including the pecorino cheese, focaccia bread and homemade pastas. And for those who prefer to leave the cooking to the natives, Claudia and her sisters will gladly prepare recipes that they have been perfecting since childhood under the tender loving care of their grandmother. The B&B and vacation apartments provide ample parking among the olive trees behind the property so you won’t have to worry about your car. Only minutes away from the center of Cortona and its rich history, starting with art, you will always be able to find a good gelato place or a little Italian cafe for a Spritzer and some people watching. Cortona has always been recognized for its prime position, starting with the legend that one of Noah’s descendants claimed the hillside for its high and panoramic position. From here it is possible to visit several of the more interesting areas in southern Tuscany and Umbria. Ask Claudia about organizing a tour or renting a bicycle and explore the area close up. If you can manage to tear yourself away from the calm atmosphere and the refreshing private pool with lots of shade nooks for reading and relaxing, you will find that the position of il Sodo del Sole is perfect for exploring central Italy. Arezzo should be the first stop on our list, especially on the first full weekend of the month when it hosts a large antique fair in the city streets. The Lake of Trasimeno has been a popular stop for those looking not only for beautiful vistas but also come fun at sandy beaches and watersports. If you go a little further east you can explore the churches of Assisi with their amazing afrescos and the world famous chocolate of Perugia. Montepulciano to the south will delight you with it’s excellent wines and cobble stoned streets. 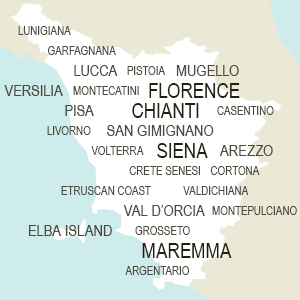 Florence and Siena are both easy to get to with the use of the main highways which connect them. My sisters and I have been managing the B&B for over 12 years now. We truly enjoy meeting the different people who arrive from all of their world and making them feel at home while they are far away from theirs. We had an excellent teacher (our Grandmother) and an extremely willing taste tester (our Father) so are all very good cooks. Our mother taught us the art of making people feel warm and welcome. These are all skills that we use while caring for our place in what we consider to be, one of the most interesting places, filled with history, in all of Tuscany.